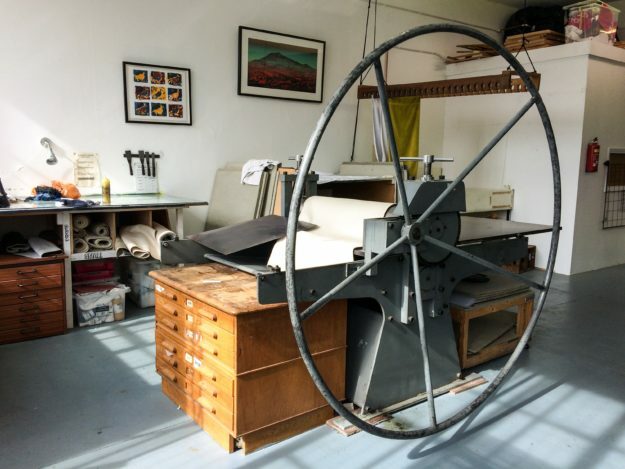 Here at East London Printmakers we are very pleased to announce our latest course this June. Our Screen Print on Paper sessions are perfect for both beginners and for people who need to refresh their screen-printing skills. During this course you will learn to plan and print designs using cut-out techniques, including how to mix inks to get the right consistency for best results. You will also learn how to coat and expose a screen using photo emulsion, and finally you will learn how to register different colours so that you can create multicolour prints. By the final session you will be working independently (under tutor supervision) to make sure you have understood all the processes that you have learned during the previous weeks. After completing the course you will have the skills and knowledge required to use the studio independently during Open Access. Here at East London Printmakers we are pleased to announce our latest course; Drypoint and Carborundum, running on the 24th and 31st May. Drypoint is a linear intaglio technique that makes use of surface, depth and texture. Line is drawn onto a flat plate (either metal, perspex or board) using any sharp implement, which is then printed using the same technique as etching. Carborundum is a way of building tone, depth and texture. Carborundum grits of different textures are mixed with an adhesive and painted onto a plate. The plate is then inked and wiped using the same technique as etching, or it can be printed in relief. This course is suitable for beginners or those with some experience who want a refresher in intaglio printmaking techniques, however participants do not need any specific experience of printmaking. Upon completion of this course you will have produced at least 2 plates with a range of gestural, textural and tonal mark making techniques. You will have printed these plates in monotone and colour, and learnt how to register multiple plates on one image. As well as this you will also have enough practice in all of the techniques to be able to continue to experiment further on your own in Open Access… To find out more and book your place take a look at this!